In light of recent events in Ukraine and in my home country, Brazil, I decided to focus this particular post on how non-violent resistance is taking form in recent democracies and how activists are “fighting back” civil and political rights violations. If you are unaware of the latest protests in Ukraine, I strongly suggest you visit Beyond Violence’s campaign profile (1).Protestors are being met with extreme violence, unlawful incarceration and having their right of privacy violated. Personal information, private messages are being used by the government as evidence of “treason” in a less-than-democratic attempt to remain in power and dissuade protestors. 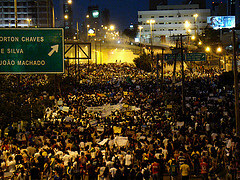 Meanwhile, in Brazil protests started in June last year on what was called “June Conferences” (Jornadas de Junho). They started with no party ownership against government corruption directly tied to the organisation of the 2014 FIFA World Cup, the increased cost of living, and rising transportation costs but were harshly repressed by law enforcement forces. By February 14, 20 protestors have died and several thousand were injured (2). Furthermore, a new bill is being discussed (3) in Parliament which could justify charging protestors with the crime of terrorism. The bill itself hasn’t sparked any specific organised reaction from the protestors, but it does fit into a larger framework of government oppression and civil rights limitations. Analysts have been calling these protests a “Tropical spring”,which is a disservice to those countries that held the “Orange Revolution” and the movement of “Caras Pintadas”(4). Protesting, at least in Brazil, has become the very essence of active citizenship. Since voting is mandatory, protesting is the “active” way of expressing your citizenship and political opinions. From a legal perspective, the demonstrations in Brazil and Ukraine show clearly the inability of the governments to guarantee and uphold the Covenant of Civil and Political Rights (1966) and the Human Rights Declaration (1948). Those, alongside the Covenant for Social and Economic Rights, are the foundations of the Human Rights framework. So, it’s up to the international society to keep an watchful eye on what is going on to make sure those principles we fought so hard to maintain are implemented to the highest standard. The internet has been established as an important tool for civil society organisations, activists and movements to inform their peers and outside parties about human rights violations, injustices and corruption. It has become a powerful instrument for advocacy and political pressure in order to hold governments, powerful individuals and corporations accountable for their actions or at the very least those international networks of activism could put in place protection mechanisms for Human Rights defenders and reporters that are being targeted for exposing the truth around the world. In Brazil and Ukraine, social media is the primary means of communication for protestors to arrange meetings, report incidents and mobilise support. However, it is actively monitored by government officials who are not only threatening the right of privacy, but also the right of free association, freedom of assembly, freedom of information, freedom of press and – you guessed it – freedom to protest. Let me repeat that governments are using private and personal messages, without legal grounds, to threaten activists, their associates and acquaintances. Non-violent protestors are being compared to terrorists and democratically elected governments are using brutal force and intimidation to subjugate their own citizens. Fortunately, these tactics won’t stop people getting their messages out. The group Frontline defenders, for instance, has launched a series of manuals for activists on how to protect your online privacy. Frontline SMS and Voxer are also great apps for communication, storing messages online and allowing communication even without Internet – walkie-talkie style. But most importantly, we, civil society, have to stay alert and hold those governments accountable online, at international fora, in Human Rights Courts and more. Making sure that when we said “Never Again!” to civil and political rights violations, we actually meant it. 1) The protests are a consequence of President Yanukovych’s rejection of an accord with the European Union in November 2013 in favour of stronger ties with Russia. This came as a surprise to thousands of people. Outraged with the government’s objection to further the country’s own economic and social development, they took to the streets of Kiev to peacefully object to this decision and the corruption involved. They occupied Independence Square, known as Maidan, until the 21st of February, when an EU-mediate peace agreement was signed between opposition and government. 2) These are very conservative numbers, however, there is no consolidated data on the deaths during protests. It is a nation-wide movement, with several different sources of data, which in a lot of cases don’t match. Furthermore, a lot of the deaths during protests have been categorised as an accident or unidentified death, which makes the gathering of data even more difficult. There have been some media efforts to keep track of those incidents, but those can be considered somewhat biased as well. 3) The Bill PLS 278/2011 was introduced in 2011 with thoughts of having it approved before the World Cup (2014) and it was being discussed in different chambers within the senate in 2013. 4) Caras pintadas (painted faces) was the student movement (1992) in Brazil that spearheaded the impeachment of the first democratically elected president after the military dictatorship, who was accused of corruption and embezzlement. Natasha Leite has worked for the last 9 years with Governance and Security in Latin America, the Caribbean, Africa and Asia. Currently she is working with Youth Development at UNICEF Maldives. Post originally at Beyond Violence. Next story What is “the project”?